Start the Fire up with Rebillia’s premium add-on feature for your BigCommerce store. Because taking the extra mile is worth it! Give your customers the complete Rebillia experience by adding this add-on directly to their “My Account” page after logging in, using their own username and password. Becomes a native part of your website, keeping your store’s look and feel. Build your customers’ trust by allowing them to fully control their account. Our multi-layered authenticacion will keep the information safe and secure. Enhance your store’s usability and customer experience. Speed up Rebillia’s assimilation and get a powerful heads up start. Add unlimited amount of cards linked to unlimited amount of addresses. Gain a secure merchant access to view and edit the customers’ information. 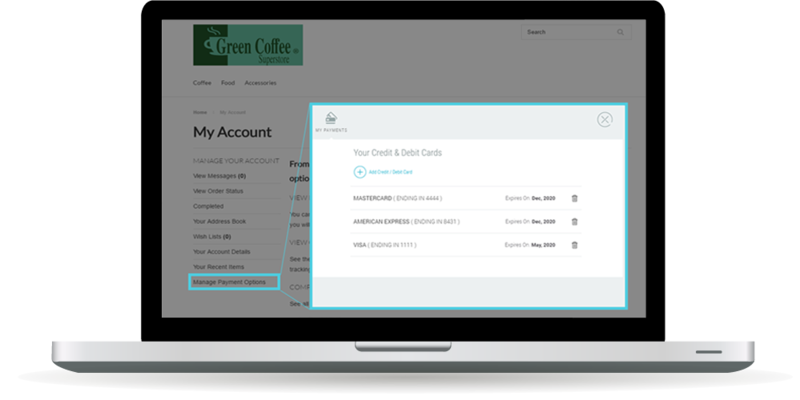 With BigCommerce’s built in functionality that allows the merchant to log in as any registered customer on the store, you can create over-the-phone orders much faster from the front end, using their saved credit cards. The “Manage Payment Options” will allow you to verify if the customer has a card saved to their account prior to going to the checkout – thus preventing possible cart abandonment (should the customer will not have their card present) and the need to ask for sensitive information over the phone. Want to set up a subscription system on your store, but don’t know if your customers will actually sign up for it? – Using Rebillia you can create a semi-automatic system and jump start ypur subscribers base. With the “Manage Payment Options” you will be able to allow your customers to manage their payment methods for the subscriptions. With the same BigCommerce functionality of logging in as the shoppers, you could also create manual charges to the customer’s account. They want expedited shipping? – Verify they have a card on their account and charge it by checking out. Announce via email blast to all your registered customers about the new functionality of safely saving credit cards to their accounts and direct them to the add-on to promptly save a card to their account prior to the next purchase. By our experience, they will save a card to their account and will be anxious to try it – which leads to some impulse purchases and positive buzz. This feature gives the shopper the feeling of being more “in control”, which is important for online shoppers these days. They also get a more personalized shopping experience – which is 1 of the top 3 demands for online shopping these days. With “Manage Payment Options”, your customers and you can add new cards without the need of going through a checkout process. As our system performs authorization checks for each card entered in this add-on, you will be able to authorize cards without the need to charge it. How do I purchase the add-on? Contact support@rebillia.com or call us at (404) 900-6858. Provide our team with your store’s URL and your account’s support PIN (extracted from your Rebillia back-end app under your name). Add our certified user merchant@rebillia.com as an administrator role user to your BigCommerce store. You will receive an email confirmation to reply to the mail address assigned to your account. What is the process of implementation? Activate the add-on software on your BigCommerce store. Collect and previously saved information from your clientele. Implement a custom made string of code to your design mode. The implementation time is subjected to the usability of the app prior to the implementation. Normally takes between 2-4 hours. The charge for the implementation will occur only after the implementation process is done and the add-on works properly. What happens if I change my existing theme? Changing a theme or a framework on BigCommerce will automatically disengage the add-on from your store, and manual implementation will be needed again. As most of the work has already been done (activation of the system and collecting prior information), we only charge $50 for re-implementation of the add-on on any given theme / framework change. In order to keep the down-time of the add-on to a minimum, we recommend contacting our team at support@rebillia.com prior to the change, and setting up a time for the implementation. I uninstalled Rebillia, but the add-on link is still showing. As part of the implementation takes place directly in your own store’s interface, uninstalling Rebillia will not take it away – rather make it and inactive link. When uninstalling the app, please contact our team at support@rebillia.com and ask them to remove the add-on from your store’s interface. And: Purchase the add-on within the first 24 hours of installing Rebillia and get $100 OFF your implementation!